1,300 Stitches Per Minute: The SINGER 14J250 sews up to 1,300 stitches per minute, making it easy to finish more complicated pieces. Electronic Speed Control : This feature guarantees a consistent sewing speed without sudden jumps. Portable: The serger features a convenient carrying handle that makes it easy to carry to class, work or home. Extra-High Presser Foot Lifter : This gives a greater clearance under the presser foot when the user needs to place multiple layers of fabric. Bouncy: Some report that the machine may be shaky during use, this can also disturb the tension dials if movement becomes too intense. The SINGER 14J250 Stylist II Serger has a number of features and stitch options. These features and options take the hassle out of serging with a 2-3-4 thread capability, wide open threading and many adjustable features. The serger also comes with a number of accessories to customize the experience. Two-Thread Wrapped Edge Overlock: A lightweight seam for woven fabrics. Three-Thread Overlock Stitch: Offers a professional seam finish that prevents loose fabrics from unraveling. Three-Thread Wrapped Edge Overlock: Good for fine and stretchy materials. Three-Thread Flatlock: Can be used as a special decorative thread to add dramatic effects or texture. Four Thread Mock Stretch Stitch: This stitch stretches as the fabric does, making it useful when sewing knit fabric. The stitch stays strong and resists popping when the fabric stretches. Rolled Hem Stitch: Adds an elegant look to elaborate upholstery and delicate garments. 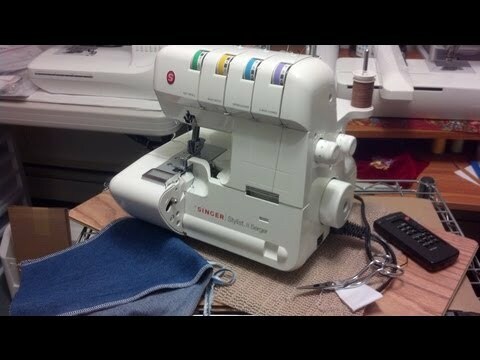 With this feature the front of the serger opens up completely giving view of the loopers. This makes threading simple and easy. The versatile thread capability allows for more stitch variety and wider expression when finishing garments. The adjustable width gauge attaches to the needle plate to keep the fabric cut and sewn effectively. The SINGER 14J250 Stylist II sews at a speed of 1,300 stitches per minute. This makes it easier to complete more complex tasks quickly. The differential feed allows the user to work with different types of fabrics from thin and delicate to thick and sturdy. It helps prevent fabrics from stretching out of shape and keeps seams from breaking or bunching. The differential feed on the SINGER 14J250 Stylist II is fully adjustable to meet the needs of every project. Click Here to See Singer 14J250 Stylist II Pricing, Pictures and Reviews on Amazon! The SINGER 14J250 Stylist II Serger is an all-around machine for completing many serging projects. It has adjustable features to fit with each user’s unique needs.